Factual programming has seen a revolution. Viewers want more from factual programmes: they no longer want traditional, staid documentaries, but want to see fast-paced in-depth stories with real human interaction behind them. This is where shows like 999: Whats Your Emergency and 24 Hours in A&E come in. 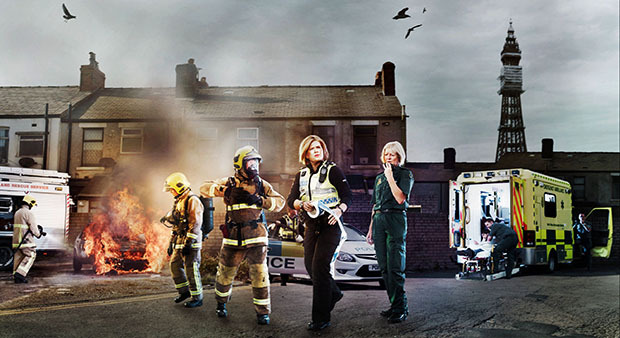 Creating programmes that deliver an in-depth look into real-life stories provides production houses with a number of technical challenges, especially on series where the emergency services are involved. The situations they face can be life or death. PROCAM Manchester provided equipment to two of the most popular emergency service observational documentaries from the past two years: Channel 4s 2012 series 999: Whats Your Emergency and the BBCs 2013 show Keeping Britain Alive: The NHS in a Day. Both built their series around following the emergency services as they dealt with incredible, unplanned and often highly sensitive stories across Britain. Johnni Javier, Line Producer at Blast Films, the production company behind 999: Whats Your Emergency, wanted to maximise the look of the series: it had to be ambitious and real but with beautiful filmic qualities. Javier explains, The UK audience is getting savvier and want more from ob docs. Broadcasters are looking for editorial content that pushes the boundaries and gives viewers behind the scenes access to life stories. Its no longer about the shock factor, but about making content thought provoking. Its not enough to show images exposing drunk people on the street, the viewer wants to know what in their life has brought them to that moment and what we as a nation are doing about it. With shots ranging from speciality camera rigs and high end helicopter shots, through to self shot material and carefully lit master interviews, the crew on 999: Whats Your Emergency had to use every technique in the book to ensure they captured every second of the action. It was a huge operation with twelve to fifteen camera operators filming at any one time throughout the entire shoot. Three crew members manned the Lancashire call centres awaiting the signal from key cast control operators that a call for Blackpool had come in. Meanwhile, the rest of the crew were continuously positioned in the back of police cars and ambulances, often for shifts up to twelve hours long, on high alert for any developing incidents. The logistical undertaking for the show was vast. To ensure all call centre stories lined up with the emergency services in Blackpool, camera crews in all locations had to work on the same time shifts. However, Javier admits that many of the scenes were down to, a lot of luck, 999 calls need to remain on the line until the emergency services arrive, so clever editing meant that we were often able to build enough of a story from the shots achieved. To capture the story from the journey to the incident, crew members had to manage a remote controlled rig inside the vehicle while being prepared to jump out and switch to self-shooters as soon as they arrived on scene. As there was limited space in the ambulances on the way to the hospital, a bespoke camera rig was set up in the back of the emergency vehicles before they set out on their journey. Taking caution with health and safety restrictions from exposed wires to limited space, the rig used a VIO POV and specialised HD micro recorders. Long shifts also meant that the remote controlled cameras in the moving vehicles would also have to deal with ever changing light conditions. Once on foot, PROCAM Manchester recommended that self shooters used the Canon XF305. Canons are light and manageable with HD set up and are great for shooting on the hoof as they are quick to set up and most crew members in the industry are familiar with them. This is a perfect set up when youre chasing the police down the street as they deal with a runaway suspect. More experienced cameramen used Sony PDW - 700s (and occasionally Sony PDW - F800s) for an improved image quality. Shoulder mounts meant that on longer shifts the crew had extra support and were good to go. Follow up master interviews were shot on a Sony PMW - F3 as often the crew found themselves going to contributors houses with sometimes limited indoor space and the Sony F3 allowed for a great depth of field. Just a year after filming 999: Whats Your Emergency; we were approached by The Garden Productions in Manchester to film its ambitious emergency services ob doc, Keeping Britain Alive: The NHS in a Day. And, despite a year passing and the arrival of new camera technology, our advice remained the same. The aim of the programme was to take a snapshot of the NHS, the organisation that treats 1.5 million of us every single day. The shoot was an immense undertaking with over 100 camera crews hired to film NHS services in 88 locations across the UK; including hospitals, GP surgeries, community services, ambulances and helicopters. Altogether an incredible 1,217 hours of footage was created with the camera of choice, the Canon XF305; chosen for its availability and ease of use for self-shooters. Such a huge shoot demanded 60 cameras plus spares, and PROCAM Manchester provided over 20 of these. The logistics of a shoot of this kind proved challenging. Most documentaries have the luxury to spend months filming stories that develop over time. With Keeping Britain Alive the crews only had one chance to get the shot, most of the time not knowing what might happen as the story unfolded. The hours of footage were then edited over five months to create eight themed episodes, each providing an insight into the inner workings of the NHS. Like 999: Whats Your Emergency, the camera of choice for capturing shots on-the-go was the Canon XF305. This camera allowed the crew to obtain the shots required but at a lower price point compared to the newer Canon EOS C300 and Sony PMW-200. Its certainly an exciting time for factual, with series beginning to overtake one off documentaries as viewers demand bigger and more ambitious observational docs. Yet, with series budgets being squeezed and quality standards remaining high, strong relationships between production houses and the broadcast hire companies are critical. Both parties rely on each others skills and expertise to create exceptional content. We believe this trend is set to continue.